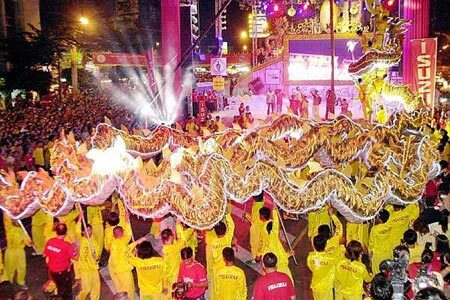 Thailand’s top destinations celebrate Chinese New Year in style with magnificent arts and colourful cultural performances presented by artists from 10 provinces in China. These visiting groups provide rare insights into China’s vast cultural diversity with authentic demonstrations of Shaolin Kung Fu and acrobatics, Chinese opera, traditional puppet demonstrations, mask-changing dances, and Chinese music performances. There are also tribal dances from Tibet and Mongolia. One of the main venues in Bangkok is the city’s Chinatown, a fascinating maze of streets and lanes crammed with shops, restaurants and street-side stalls. But there are celebrations to mark the arrival of the Year of the Tiger in the city’s up-scale shopping district around Central World Plaza and the National Theatre next to Sanam Luang.